This product review provides detailed information about Mother’s Special Blend Skin Toning Oil. The manufacturer claims that this oil prevents stretch marks by acting as a natural nourishment and conditioner for expanding and contracting skin in pregnant women. It keeps the rapidly growing body comfortable and safe. Read on to learn more about this oil. Coconut Oil- has excellent moisturizing capabilities. This natural oil protects the skin by forming a layer that helps to retain moisture and maintain a firm molecular structure. It protects the skin against damage (free radicals), stimulates healing, and promotes a youthful appearance. Coconut oil also penetrates the skin to strengthen skin tissues. It also has high amounts of Vitamin E, which acts as a natural preservative. Sweet Almond Oil- has high concentrations of fatty acids. This natural oil has emollient properties help to moisturize and soften the skin. Cocoa Butter- acts as a skin softener and conditioner. Vitamin E– antioxidant that helps in the formation of normal tissues and protects collagen and body fat from damage. Women who are planning to get pregnant should start using this product one month prior to pregnancy. You can also use it in the course of pregnancy and one to three months after pregnancy. Apply to the abdomen, buttocks, breasts, and thighs every day after taking a shower. The manufacturer acknowledges that different people can be sensitive. To be careful, it is vital to test this product on a small area of your elbow and wait for about twenty-four hours to ascertain that it does not cause undesired reactions. This product contains a safe blend of natural ingredients that are safe for pregnant women and unborn babies. It does not contain any animal ingredients, perfumes, chemicals, preservatives, dyes, or emulsifiers. It can be applied all over the body without causing any unwanted effects. The manufacturer assures users that this product has been proven to have no unwanted reactions for more than 35 years. The price of one bottle (8 oz) is $12.00 on the official site. If you buy two bottles, you get one free bottle and pay $29.95 for the three bottles. This is an affordable price considering the size of the bottle. There is no product guarantee for this product. The absence of a guarantee is likely to cause quality-related questions. However, this product has many positive reviews compared to most products on the market. It is evidence that most users are happy with the results. In summary, this is a suitable product for preventing stretch marks. One of the merits of this product is that it contains natural ingredients that are safe for pregnant women and the developing fetus. In addition, there are many positive reviews from users. However, there is no money-back guarantee to assure buyers of compensation in case the product fails. Furthermore, there is no information about GMP certification. If you couple these concerning factors with the fact that this product is not an effective remedy for existing striae, you may want to keep looking for a suitable stretch mark product. 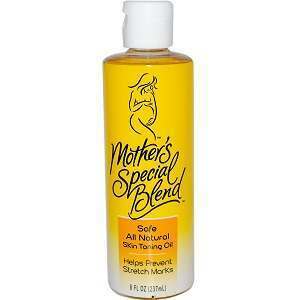 David Carney	reviewed Mother’s Special Blend Skin Toning Oil	on August 15th	 and gave it a rating of 2.5.